. 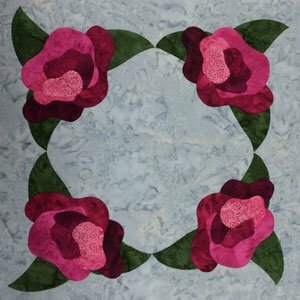 Quiltmaker's 100 Blocks Volume 14 - "Roses Squared"
It is so exciting to be a part of Quiltmaker's 100 Blocks Volume 14 Blog Tour. My block is called "Roses Squared". I chose a gray batik for the background, a green batik for the leaves and 6 rose/pink batiks for the rose petals. I love working with batiks. They have some wonderful characteristics. They usually have a very high thread count which reduces fraying. They allow you to produce very sharp, crisp points and very smooth edges. Their color is all the way thru the fabric eliminating white threads that can make an unwelcome appearance. Your seam allowance can be cut to 1/8" without worrying about fraying. By keeping the setting simple this table runner sets off your beautiful applique. Pull the colors for the setting triangles from the colors of the roses. All too often quilters think batiks are hard to applique. I have three suggestions that will make the process easier. 1. Pre-wash all of your fabrics before beginning. As piecers we like our fabric a little on the stiff side. As appliquer's we prefer just the opposite. By pre-washing we can remove all the excess sizing and dye. This will leave the fabric much softer. It will be much easier to applique. As we applique we will be able to manipulate with our needle any unruly seam allowances. If your fabric is still too stiff after one washing, wash it again. 2. Use a very fine (thin) needle when appliqueing. I like to use a size 12 needle. It can be intimidating to use such a fine needle but with a little practice you will feel comfortable in no time. I love the Clover Black and Gold Quilting™ Between Size 12 needles. These needles are very fine and absolutely glide through my fabric. They are also very short allowing me to very easily achieve very short, tiny stitches. 3. Use the flat end of an orange stick to turn under the seam allowance. Use the pointy end to smooth out those seam allowances. Roses are even great for fall quilts. 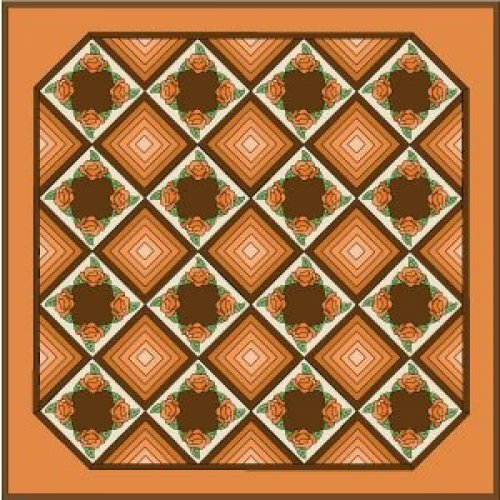 In this quilt I have appliqued rich, fall, orange roses around a dark brown center. What could be more "fallish"? "Roses Squared" calls for crisp points and smooth curves. There is a secret to creating beautiful applique. Do you know what it is? Click here to learn the secret of beautiful applique. Have you ever been away from applique for a period of time and been hesitant to start right in on a new project? There is an easy way to get back in the grove. Grab a small scrap for a background and a piece of WHITE fabric to use for an applique shape. Applique a shape onto the background fabric using BLACK silk thread. You will very quickly see if you are doing the applique stitch properly. You will see just the very smallest points of black along the edge of your applique. You shouldn't actually see any stitches - just little dots where your applique thread came out of the fold then wrapped around under the applique fabric to disappear almost completely.